Pulled pork is inexpensive and incredibly fast when made with a pressure cooker. This recipe is excellent for making tasty salads for a large group or giving yourself plenty of leftover pork to utilize in other recipes. 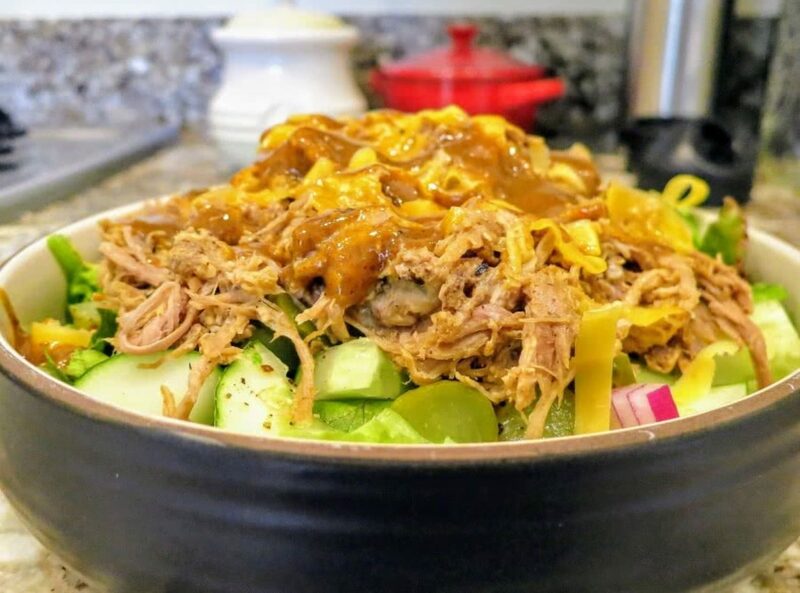 The time to make the pork required is greatly reduced due to the pressure cooker and the flavor remains top notch for such an incredibly easy, no hassle, way of making pulled pork. The mustard BBQ sauce gives the meat an excellent Carolina inspired taste. The salad itself is incredibly adaptable. Take the ingredients listed below and run with them. Add pork and 2 cups of water to pressure cooker. Pressure cook the pork chunks on high pressure for 55 minutes. Remove the pork and shred. It should shred very easy. Do not over shred the pork or else it will be stringy mush. Discard all but 2 Tbsp the water from pressure cooker. Sweat the onions and peppers in the remaining water in the pressure cooker for 3-4 minutes or until onions are translucent. Add the sage, thyme and garlic and cook for 30 seconds or until aromatic. Add the shredded pork back into the pot and stir to combine. Add Worcestershire, BBQ sauce, salt and pepper and stir. Prepare salad bowls for the pork by chopping the lettuce and other salad toppings. Add extra mustard BBQ sauce as desired. Shred cheddar cheese over pork.